Peter Norman is the 'forgotten man' in one of the most powerful and influential photos of all time. Peter is in the photo because he won Australia a silver medal at the 1968 Mexico Olympics after running the 200 metres in 20.06 seconds. In 2018, 50 years on, it is still the Australian record. 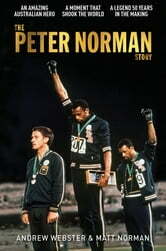 But Peter Norman is a hero to millions today not for the race or the record, but for what he did next. That act of solidarity cost Peter Norman everything. All three men were cast into exile, their lives sent spiralling. But it secured a unique friendship - and a legend that, in its 50th anniversary, is more powerful than ever. This is the extraordinary story of the man behind the photo and a moment that changed the world. It's a strange odyssey of a working-class, Salvation Army-raised boy from Melbourne who became a global icon for equality and courage, yet who remained an enigma to even those closest to him. It's a story about taking a stand and inspiring people everywhere to stand with you. The story of a unique hero who has gone unsung for too long. The Peter Norman Story.